‘C.N. 6678 mentioned that the Alain White Collection was housed in the South Africa National Library. However, this is a collection not of A.C. White’s own chess books but of about 500 volumes compiled by Donald G. McIntyre and named after A.C. White. Our correspondent asks what became of A.C. White’s own chess book collection, which numbered ‘somewhat less than 2,000 volumes’ in 1907, according to an article by White on page 38 of the Chess Amateur, November 1907. Source: The Golden Dozen by Irving Chernev (Oxford, 1976), page 260. ‘My copy of Stamma’s The Noble Game of Chess (London, 1745), which introduced the algebraic notation to the West, has the bookplate of the “Marquis Townshend”. I found that the first Marquis was the brother of the man who authored the “Townshend Acts”, which were among the sparks that helped bring on the American Revolution. The Marquis title was first conferred on the family some years after 1745. 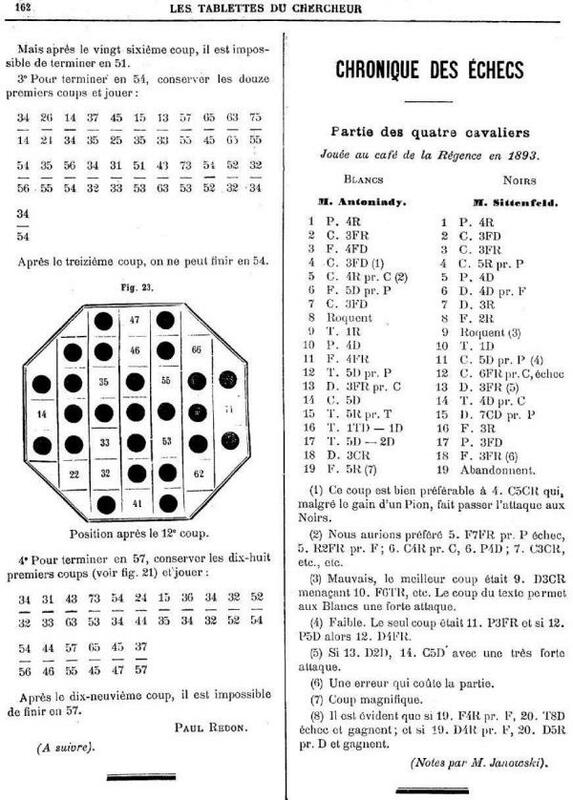 Among the subscribers to Philidor’s Analyse du jeu des échecs was ‘M. Townshend’. 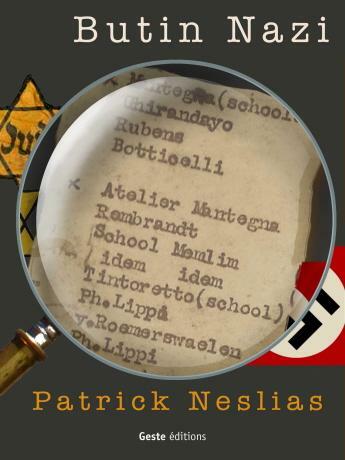 Mr Neslias informs us that in October 2010 his book Butin Nazi, dealing with Nardus’ final period in Tunisia, will be published by Geste éditions. 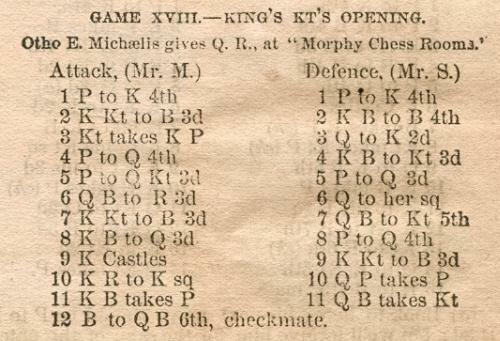 John Blackstone (Las Vegas, NV, USA) notes that on page 7 of the 16 December 1908 issue of the New York Evening Post Emanuel Lasker gave a version of the seventh match-game between Marshall and Mieses (played in Berlin on 28 November 1908) which deviated from the commonly-published score. 22 Bxf7+ [‘22 Rb1 Rb2 23 Rxb2 Qxb2 24 b5 Qe2 25 Bxf7+ Kh8 is the line given by Lasker.’] 22...Kh8 23 Rb1 Rb2 24 Rxb2 Qxb2 25 b5 Qe2 [‘Now the lines come back together.’] 26 Qxa7 Qxb5 27 Qe3 Qb4 28 Bd5 Bd4 29 Qe2 Qb2 30 Qxb2 Bxb2 31 Kg2 Rd8 32 Rb1 Rxd5 33 Rxb2 h5 34 f4 Kh7 35 Kh3 g5 36 Rb7+ Kg6 37 Rb6+ Kf5 [‘37...Kg7 38 Rb7+ Kg6 39 Rb6+ Kf5 40 Rh6 was given by Lasker.’] 38 Rh6 h4 39 Rh5 Kg6 40 Kg4 hxg3 41 hxg3 [‘This is where Lasker states that Black resigned.’] 41…Kf6 42 Rxg5 Rxg5+ 43 fxg5+ Kg6 44 Kh4 Kg7 45 Kh5 Kh7 46 g6+ Kg7 47 Kg5 Kh8 48 Kh6 Resigns. 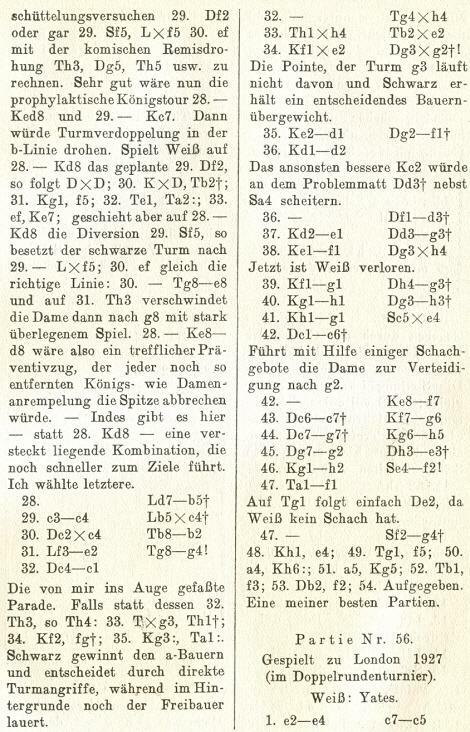 The 48-move version was given in various magazines of the time, an example being Deutsches Wochenschach, 13 November 1908, pages 449-450. Even so, Lasker was in Berlin at the time of the game. His column in the Evening Post was headed ‘Berlin, 2 December’, and the introductory text too was reproduced in Lasker’s Chess Magazine (on page 40 of the above-mentioned issue). Leonard Barden (London) informs us that his daily (Monday-Friday) chess column in the London Evening Standard began in early June 1956. Apart from one week in May 2009 when it appeared on-line only, the column continued in the newspaper until 30 July 2010. Since then, it has been published exclusively on-line. Has there ever been, in any journalistic field, such a run for a daily column by a single individual? 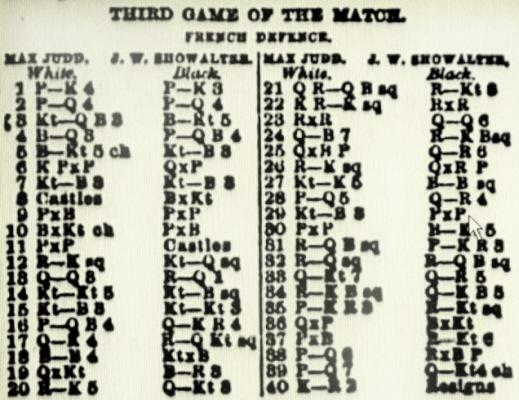 Eduardo Bauzá Mercére (New York, NY, USA) sends the third game in the Judd v Showalter match, as published on page 5 of the New York Sun, 13 December 1891, and asks whether the score is correct. 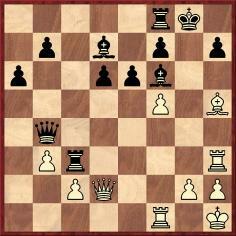 In particular, do other sources explain Black’s resignation or mention 38...Qxd6 and 40...Rd3 as possibilities? 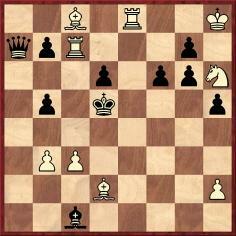 1 e4 e6 2 d4 d5 3 Nc3 Bb4 4 Bd3 c5 5 Bb5+ Nc6 6 exd5 Qxd5 7 Nf3 Nf6 8 O-O Bxc3 9 bxc3 cxd4 10 Bxc6+ bxc6 11 cxd4 O-O 12 Re1 Nd7 13 Qd3 Rd8 14 Ng5 Nf8 15 Nf3 Ng6 16 c4 Qh5 17 Qe4 Rb8 18 Bf4 Nxf4 19 Qxf4 Ba6 20 Re5 Qg6 21 Rc1 Rb1 22 Ree1 Rxc1 23 Rxc1 Qd3 24 Qc7 Rf8 25 Qxc6 Qa3 26 Re1 Qxa2 27 Ne5 Bc8 28 d5 Qa5 29 Nf3 exd5 30 cxd5 Bg4 31 Rc1 h6 32 Rd1 Rc8 33 Qb7 Qa4 34 Rf1 Qf4 35 h3 Rb8 36 Qxa7 Bxf3 37 gxf3 Rb3 38 d6 Rxf3 39 d7 Qg5+ 40 Kh2 Resigns. 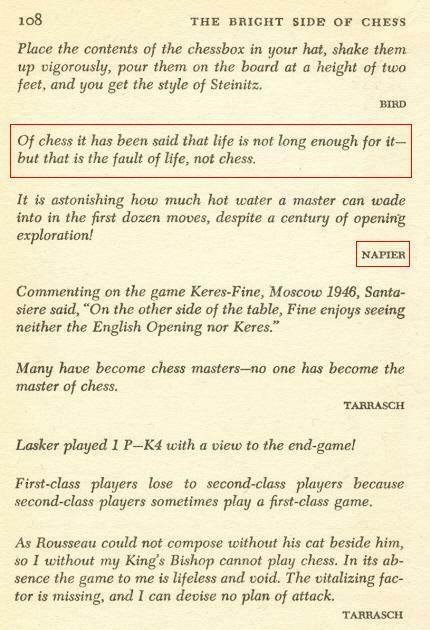 The retort is indeed sometimes attributed to Napier (for example, in a piece which appeared under Frank Elley’s name on page 30 of Chess Life, March 1986), but we do not recall seeing it in Napier’s writings. 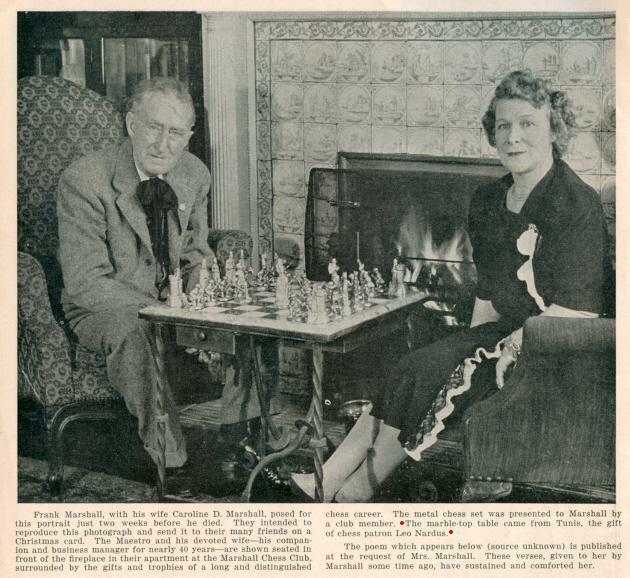 We commented that the longer quote is often attributed to Irving Chernev, who gave it (without claiming paternity) on page 108 of The Bright Side of Chess (Philadelphia, 1948). Moreover, the book’s layout created the false impression that Chernev was ascribing the remark to Napier. 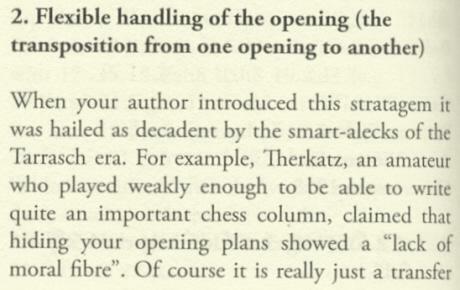 Another case of confusion arising from the layout of quotes in that section of The Bright Side of Chess is the ‘conferred sight’ remark attributed to Capablanca (see C.N. 4209). On page 313 of the October 1969 BCM D.J. Morgan listed ‘Life is too short for chess, but that is the fault of life, not chess’ as an unnamed reader’s entry in a ‘Views on Chess’ competition. It was published on page 30 of the Observer of 31 October 1937. This is relevant to the discussion of the quote, and its author, in C.N. 5462. A famous remark, it was reproduced on page 17 of The Big Book of Chess by Eric Schiller (New York, 2006) with only two mistakes (‘quiescent’ and ‘poetry and signs’). Tom Wiswell has been mentioned in several C.N. items, and now Gene Gnandt (Houston, TX, USA) draws our attention to the checkers master’s appearance on an edition of the television game-show What’s My Line? broadcast on 21 February 1954 (starting at about 5’30” into the segment). 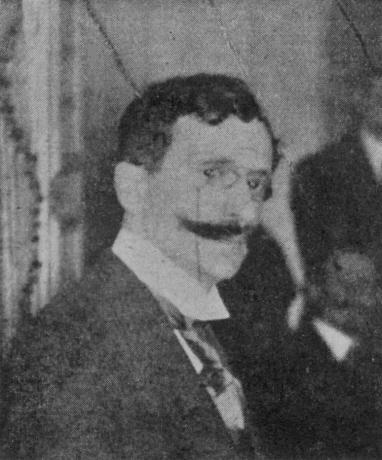 Justin Horton (Huesca, Spain) comments that many Internet pages place Nimzowitsch’s alleged lament about losing to ‘this idiot’ (Sämisch) not in Berlin, as stated by Kmoch, but at Baden Baden, 1925. 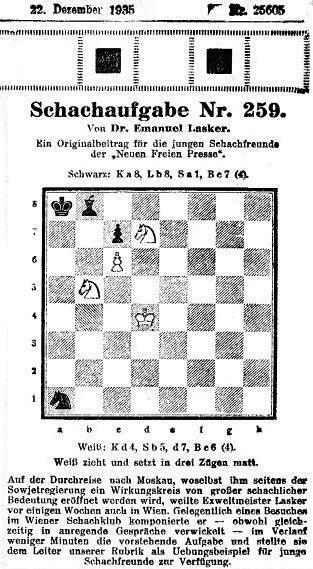 Half-way through that tournament Nimzowitsch did indeed lose to Sämisch, but what evidence exists that such an incident occurred there? 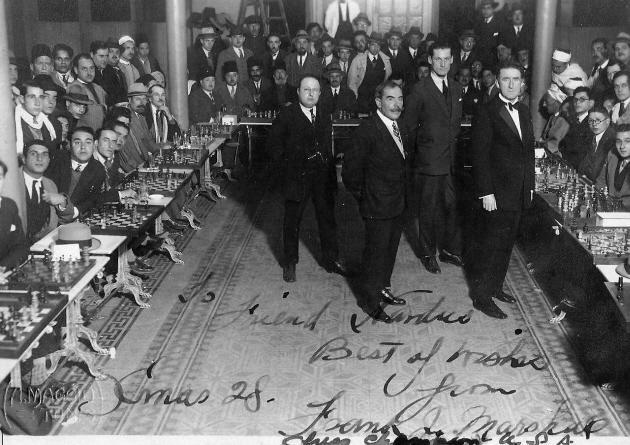 Javier Asturiano Molina (Murcia, Spain) asks for information about the exact occasion when the famous game Wendel v Nimzowitsch (‘Stockholm, 1921’) was played. Acknowledgment: Calle Erlandsson (Lund, Sweden) and Peter Holmgren (Stockholm). 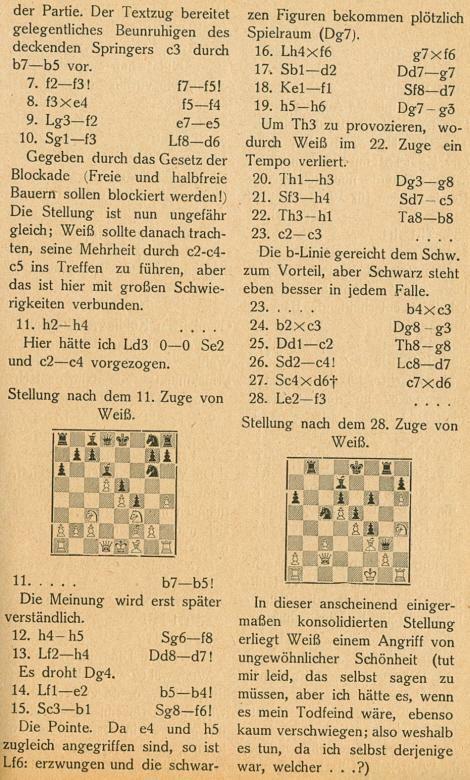 That same issue had Nimzowitsch’s notes to games by Wendel against Olson and Spielmann, but neither of Nimzowitsch’s victories against Wendel in the tournament was given. 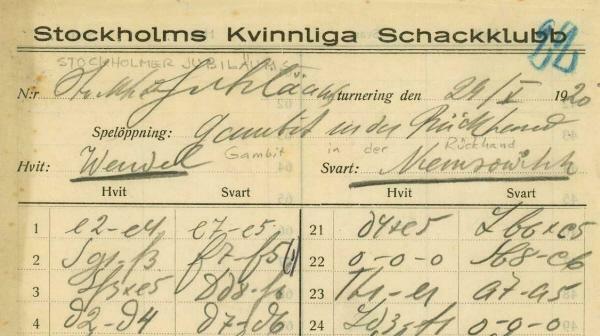 Nor has any reference to a Nimzowitsch v Wendel match been found in the Swedish magazine or elsewhere. 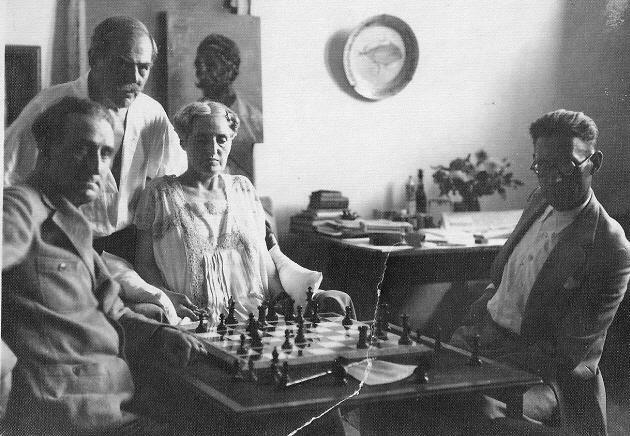 It may thus be wondered whether the Wendel v Nimzowitsch game under discussion was, in fact, played in the Stockholm tournament of October-November 1920, and not in 1921 as stated by Nimzowitsch. 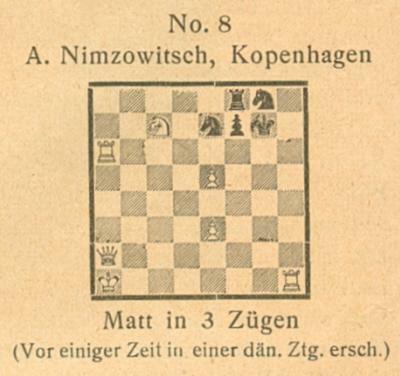 In that case, though, Nimzowitsch could have been expected to publish ‘one of my best games’ in the Tidskrift för Schack of the time, i.e. 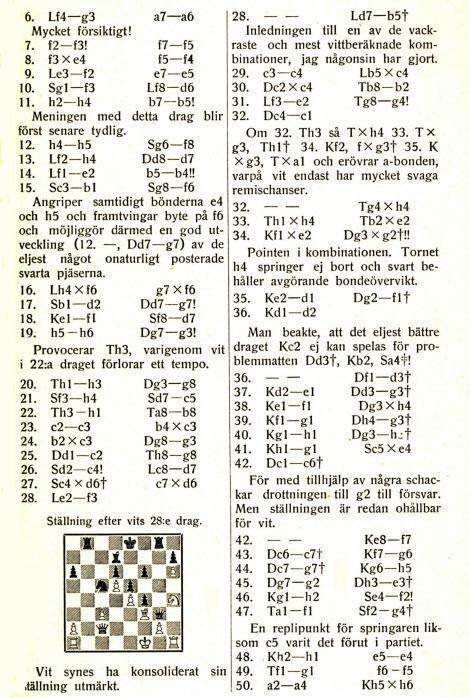 together with his wins against Olson, Spielmann and Jacobson from the Stockholm, 1920 tournament (which he did annotate in the November-December 1920 edition of the magazine). 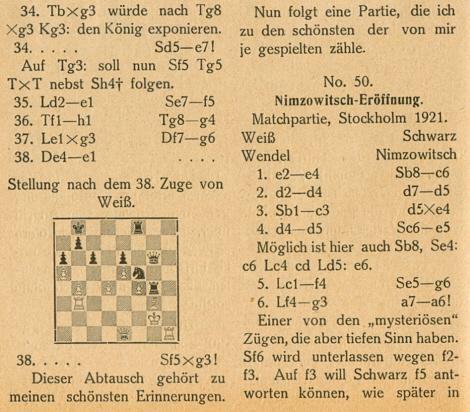 However, as shown above, his notes to the Wendel v Nimzowitsch game were not published until the January-February 1922 issue. 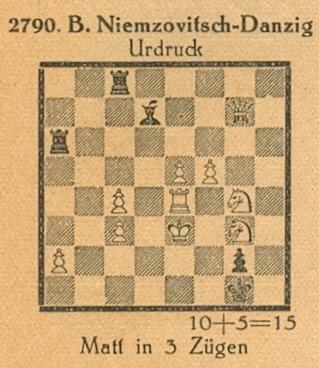 If, therefore, the date 1921 for the Wendel v Nimzowitsch game is correct after all, an event in which it could have occurred remains to be identified. Olimpiu G. Urcan (Singapore) mentions that a better copy of the Reshevsky photograph can be viewed in the Cleveland Public Library Digital Gallery. A question from Calle Erlandsson (Lund, Sweden): are any photographs available of the Scottish player Peter Reid (1910-1939)? 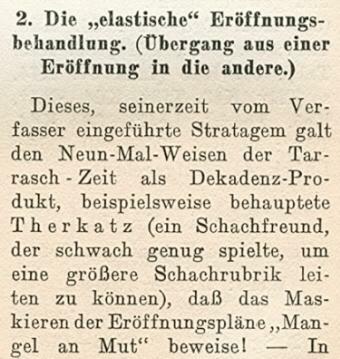 The report of Wilhelm Therkatz’s death on page 12 of the January 1925 Wiener Schachzeitung stated that he had conducted the chess column in the Krefelder Zeitung for 26 years. B.H. Wood was acquitted at Birmingham Assizes on 14 July, without calling upon any evidence, of a charge of criminal libel instituted by W. Ritson Morry. 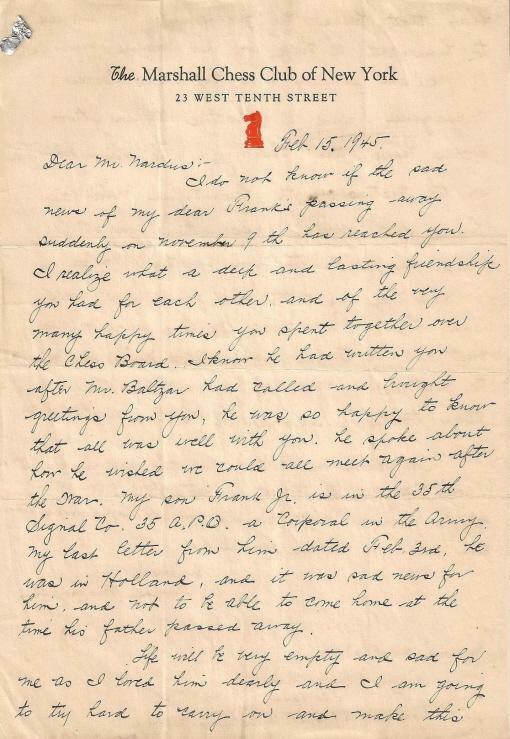 In a letter to a Mr Golding, Mr Wood had indicated that if Mr Morry was in the new Welsh Chess Union, Mr Wood was out; he referred to Mr Morry as “this ex-gaolbird”. It was held that Mr Wood was entitled to give his reasons for withdrawing; that the description was true, as Morry, after misappropriating clients’ money as a Solicitor some years before, had been sentenced to 18 months’ imprisonment. James Plaskett (Cartagena, Spain) asks whether further details are available on Ritson Morry’s offence. We note from Google Books (snippets shown by a search for ‘Ritson Morry’ and ‘solicitor’) that 1940s law reports had information on the case. Could a reader with access to the documents supply an account of the proceedings? ‘Every chess master was once a beginner’ is an observation regularly credited to Irving Chernev. Where did he write it? 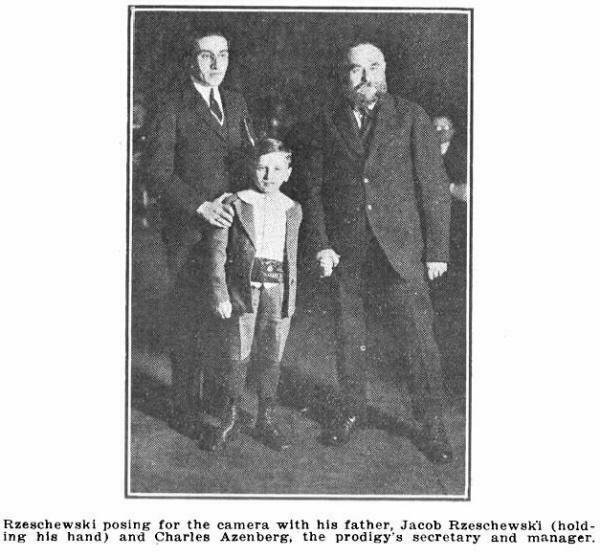 ‘Aron Nimzowitsch had three younger brothers, and Benno (or Benjamin) was the youngest. 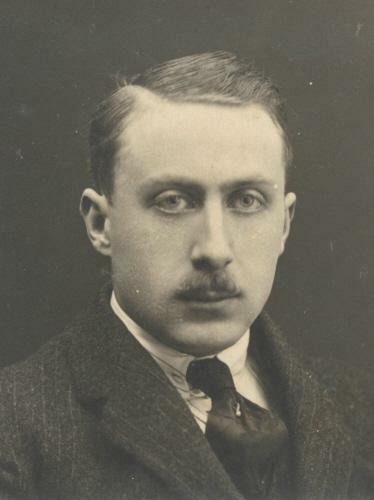 He was born on 14 May 1896 (new style) and by the first of his two marriages he had a son, Isay-Erik (born in Berlin on 28 July 1928). Benno lived in Berlin for several years, before moving to Langfuhr, Danzig. 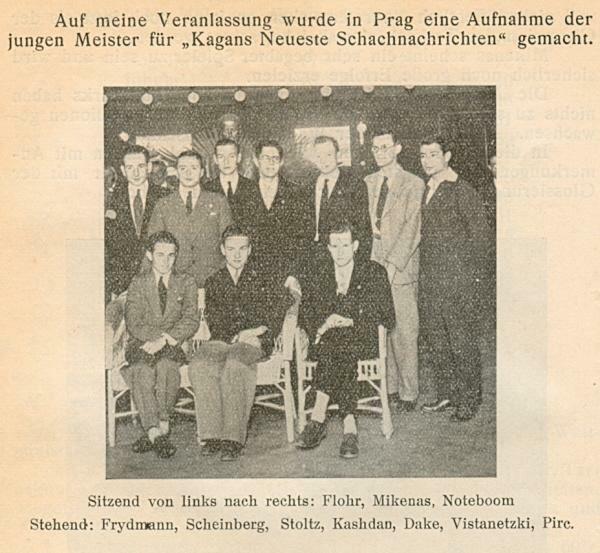 He was a strong chessplayer as a boy but put his efforts into problem composition. 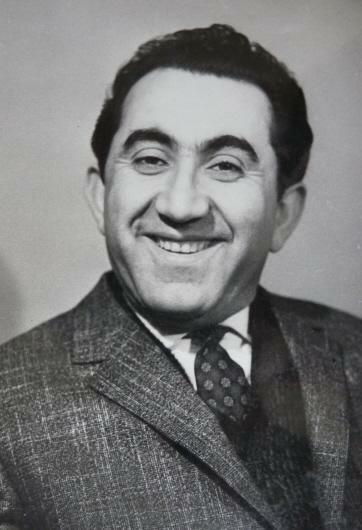 Because of his Jewish background, he had to flee from the Nazis, and he finally went back to Riga. The Nazis killed the entire family in 1941. 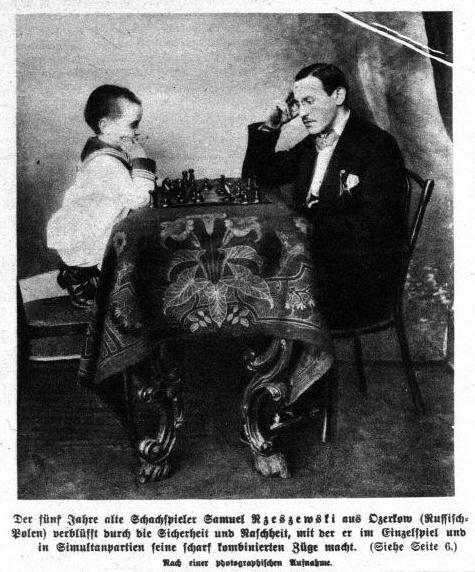 ‘An early game between Benjamin Blumenfeld and Aron Nimzowitsch, Berlin, 1903 (1 e4 e5 2 Nf3 Nc6 3 d4 exd4 4 Nxd4 Nf6 5 Nxc6 bxc6 6 Bd3 d5 7 e5 Ng4 8 O-O Qh4 9 h3 h5 10 Bf4 Bc5 11 Qd2 Rb8 12 Nc3 Rb4 13 Bg5 Qg3 14 hxg4 hxg4 15 Rfe1 Rh2 16 Bf1 Rh8 17 Bd3 Rh2 18 Bf1 Bxf2+ 19 Qxf2 Rh1+ 20 Kxh1 Qxf2 21 Re2 Qg3 22 Rd1 Bf5 23 Nxd5 cxd5 24 Rxd5 Rb8 25 e6 fxe6 26 Rxf5 Kd7 27 Rf7+ Kc6 28 Rxe6+ Kb7 29 Kg1 Resigns) can be found on the Internet, but we have not been able to trace a source for it. 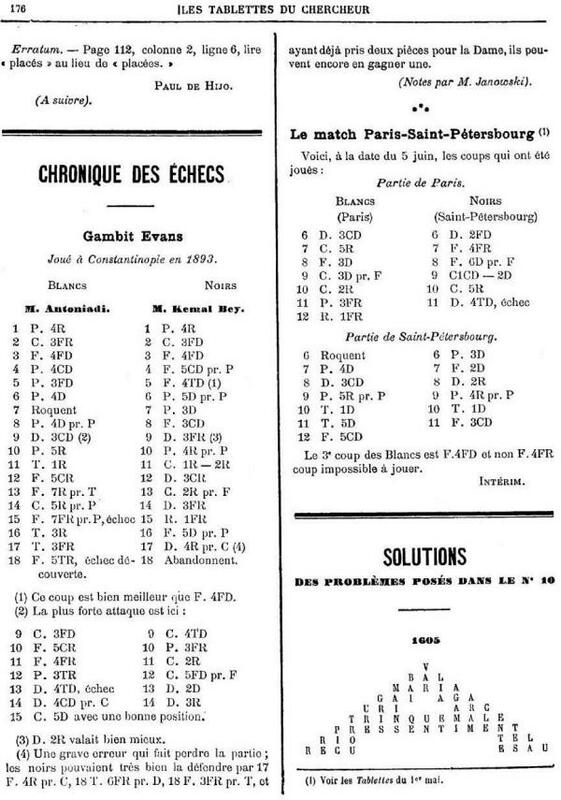 A serious disservice is done to chess history by some ‘modern’ editions of old tournament books. The latest example is London 1922 by G. Maróczy (Milford, 2010), which not only discards the original book’s introductory material but brushes out the editor and publisher, W.H. 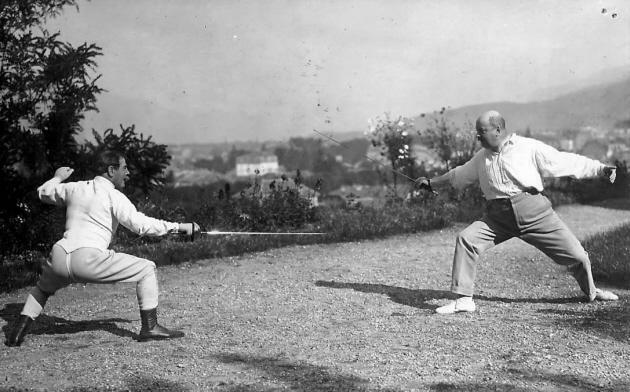 Watts, and a master, Amos Burn, who annotated at least 18 of the games. 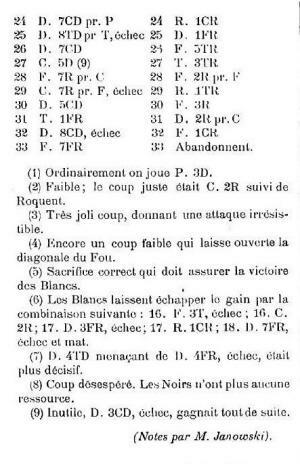 Dominique Thimognier (Fondettes, France) has found an article by Louis Mandy on pages 51-52 of the May-June 1955 issue of L’Echiquier de Paris. Entitled ‘La Rennaissance Echiquéenne’, it discussed the chess magazine of that name, which was edited by Gesztesi/Gestesi during its brief run (March-July 1912). ‘As mentioned by David McAlister in C.N. 6733, the only references to Ritson Morry in the Law Reports relate to a decision of the Court of Criminal Appeal on 29 October 1945, before Hilbery, Wrottesley and Stable, the appeal being based on technical legal grounds. I offer a summary below. At the summer assizes at Birmingham on 25-26 July 1945 the appellant, William Ritson Morry, a solicitor, was tried on an indictment containing four counts charging him with fraudulent conversion of four sums of money totalling £3,136. He was convicted on all counts and sentenced to 18 months’ imprisonment. He appealed against his conviction on a number of technical legal grounds and represented himself at the Court of Criminal Appeal. In response to that question he took the opportunity to make a speech, lasting some three hours, as an advocate on his own behalf. He now appealed on the grounds that because every word of his speech was not taken down and certified, the committal was irregular and the whole indictment should have been quashed. The Court of Criminal Appeal held that the procedure of calling upon the accused to make a statement if he chooses at that stage in the proceedings, where the magistrates are considering whether or not a case is made out for committal, was never intended to apply to a man making an oration as an advocate on his own behalf. They therefore dismissed this ground of appeal. Another ground of appeal was that the magistrates had refused to commit him for trial on the charges which were the subject of counts one and two in the indictment. The trial judge had, however, decided that these counts should be included in the trial, as well as counts three and four (on which the magistrates had committed him), and the appellant was duly convicted on all four counts. The Court of Criminal Appeal held that this was a matter for the trial judge to decide, and his decision could not be questioned. The appeal was therefore dismissed, and the Court held that the sentence of 18 months’ imprisonment would run from the date of conviction, namely from the first day of the assizes (25 July 1945). 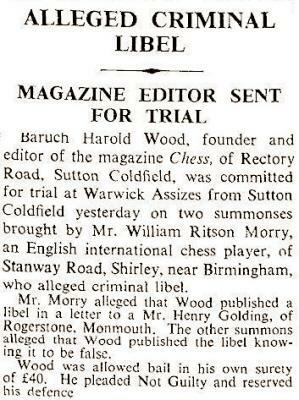 The Wood v Ritson Morry case was reported in the Times newspaper on 7 April 1954, when B.H. Wood was committed for trial, and on 15 July 1954, when he was acquitted on the charge of criminal libel. That report also quoted two officials of the British Chess Federation, Sir Leonard Swinnerton Dyer and George Wheatcroft, as stating that they were aware of Morry’s past conviction but had had no objection to his holding office in the Federation. From personal knowledge I can give a fuller answer to James Plaskett’s question in C.N. 6724. I studied law at Birmingham University from 1965 to 1968 and whilst there I played in the Birmingham chess league at a time when B.H. 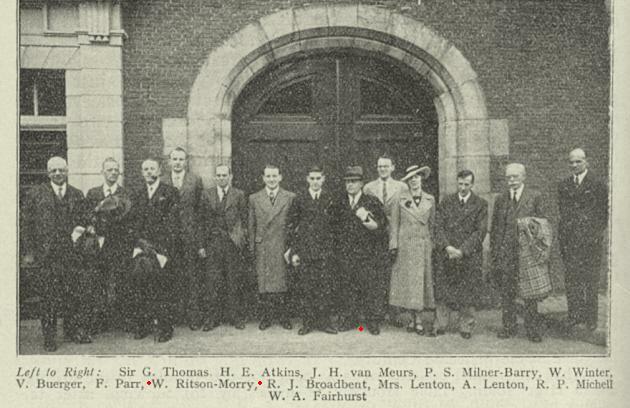 Wood and W. Ritson Morry (both also graduates of Birmingham University) were still playing in the league. I had several long conversations with Wood, who was President of the University Chess Club and, as I recall, it was he who told me the story of Ritson Morry’s downfall. 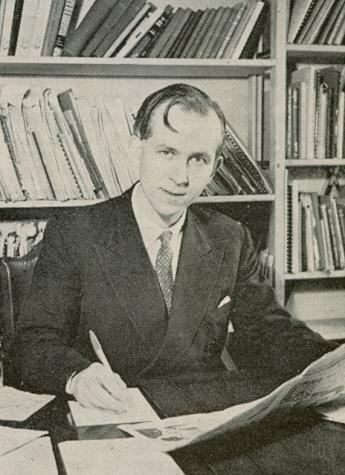 In the late 1930s Ritson Morry, who was a solicitor, invested clients’ money without their knowledge or consent in a speculative property development. He was convinced that the development would make a large profit and he would be able to replace the clients’ money and take the profit for himself. Unfortunately for Ritson Morry, with the outbreak of the Second World War the development collapsed and he lost all the money which had been invested. As he was unable to replace his clients’ money from his own resources, they reported the matter to the police as soon as they became aware of the situation, and this resulted in his eventual conviction and imprisonment, and also in his being struck off the roll of solicitors. C.N. 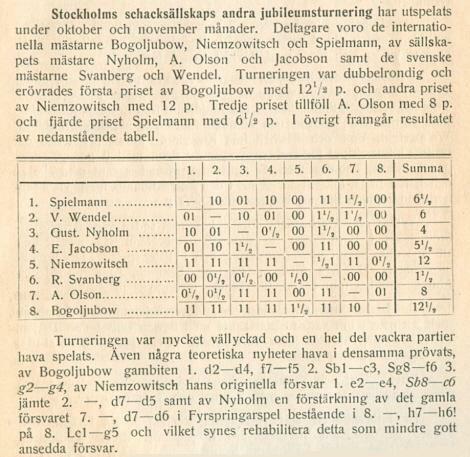 6719 asked whether the Wendel v Nimzowitsch game under discussion (which began 1 e4 Nc6 2 d4 d5) was perhaps played in the double-round tournament in Stockholm, October-November 1920. Zenón Franco Ocampos (Ponteareas, Spain) asks whether this is true. 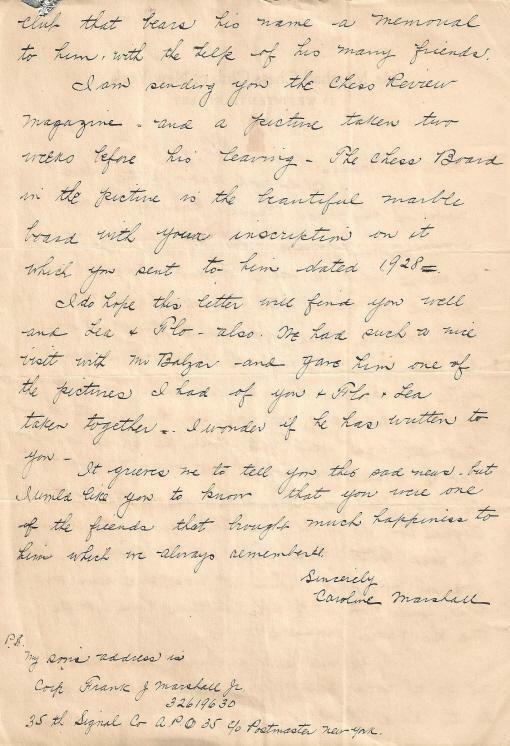 The answer is no, because Lasker was invited to New York, 1927. We discussed the matter on pages 195-197 of our book on Capablanca, referring to the bitter public dispute which had arisen at New York, 1924 between Lasker and Norbert Lederer (the latter being a key figure on the organizing committees of New York, 1924 and New York, 1927). 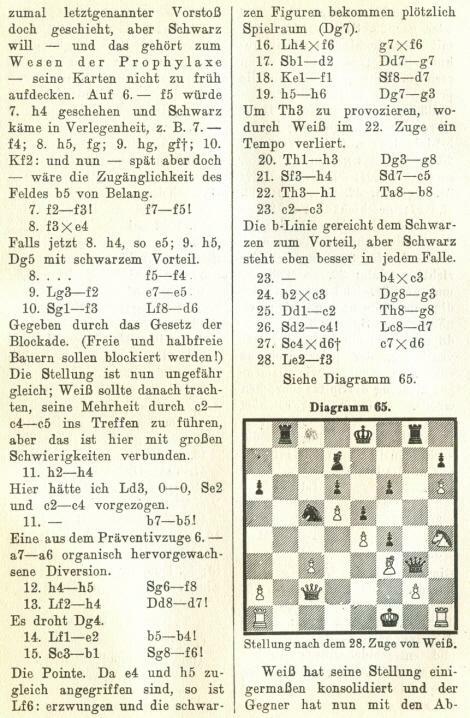 See also pages 74 and 640 of Emanuel Lasker: Denker Weltenbürger Schachweltmeister edited by R. Forster, S. Hansen and M. Negele (Berlin, 2009). 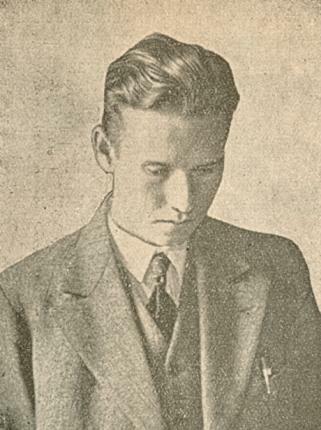 Page 48 of the February 1932 issue stated that the photograph had been given to Kagan by Euwe. ‘1. Vauvenargues (Vauvenarga or Vauvenargo in the Provençal language, which was still dominant in the area in the 1870s) is a village in Provence. Vauvenargues is the French version, but the village is located in Occitania and so has its Occitan name, but there are six dialects, of which Provençal is one. 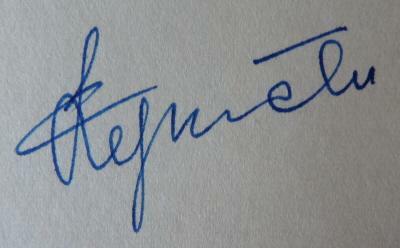 Within Provençal there are two orthographical norms, one of which gives “Vauvenargo” and the other “Vauvenarga”. The latter would almost certainly be favoured today. 2. The château, bought by Picasso in 1958, belonged to the Isoard family from 1790 to 1943. Information is available under “Histoire et patrimoine” at the website of the Mairie de Vauvenargues. 3. In all variants of Occitan (including Provençal) “o” is invariably pronounced “ou” unless it has a grave accent (ò), in which case it should be pronounced like the “o” in Opéra. The book added that Sämisch called Alekhine’s victory ‘the most brilliant game I have ever seen’. The moves: 1 e4 c5 2 Nf3 Nc6 3 Be2 e6 4 O-O d6 5 d4 cxd4 6 Nxd4 Nf6 7 Bf3 Ne5 8 c4 Nxf3+ 9 Qxf3 Be7 10 Nc3 O-O 11 b3 Nd7 12 Bb2 Bf6 13 Rad1 a6 14 Qg3 Qc7 15 Kh1 Rd8 16 f4 b6 17 f5 Be5 18 fxe6 Bxg3 19 exf7+ Kh8 20 Nd5 Resigns. 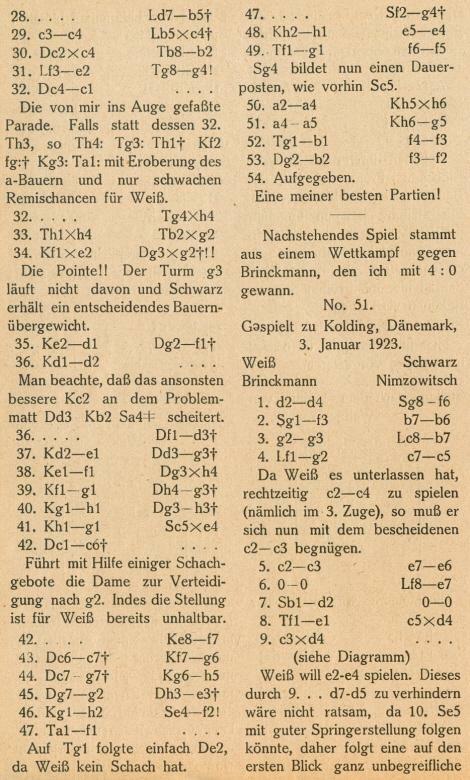 January, rather than February, 1923 was specified when the game appeared on pages 218-219 of the second volume of Complete Games of Alekhine by V. Fiala and J. Kalendovský (Olomouc, 1996). 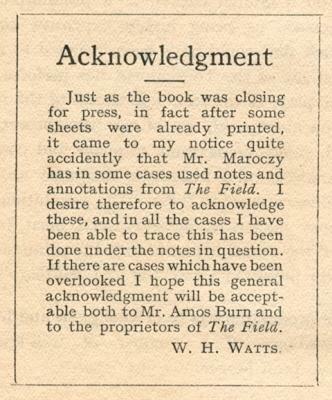 The co-authors asserted that the game was first published on page 16 of the Observer, 4 March 1923. In neither that volume nor in the Skinner/Verhoeven book on Alekhine (see page 184) was it suggested that Alekhine or Sämisch played the game blindfold. Moreover, the score was not included in Blindfold Chess by E. Hearst and J. Knott (Jefferson, 2009). 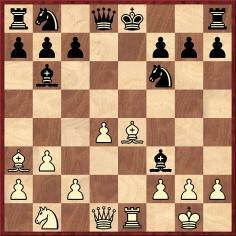 The brilliancy is absent from all the chess magazines of 1923 that we have consulted so far. 6742. William Hartston in Now! 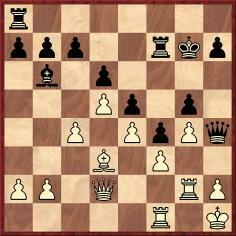 Some years ago I was playing in the Hastings tournament with Mikhail Tal. One evening, he picked up an English newspaper, casually glanced at the chess column and started laughing. 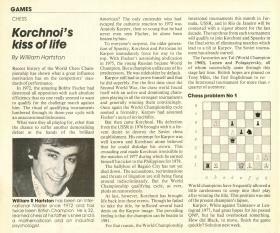 What had attracted his attention was the position given for readers to solve: it was from his own game against Platonov played at Dubna in 1973. 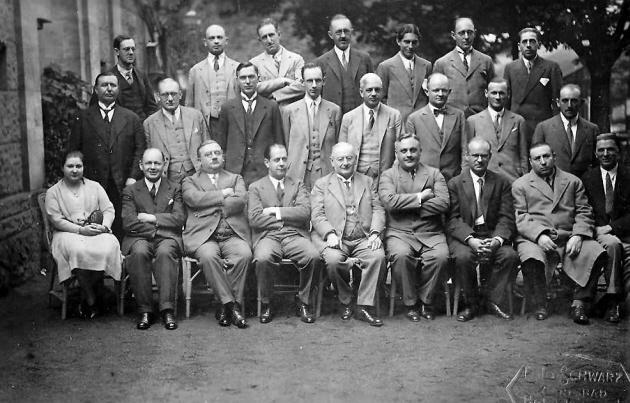 The judiciary committee of the National Chess Federation, of which Judge Jacob E. Dittus of Chicago is chairman, has adjudicated the controversy between Dr Emanuel Lasker of Berlin, former world’s champion and winner of first prize in the international masters’ tournament in New York, 1924, and Dr Norbert L. Lederer, director of that tournament, according to advices received from Chicago. 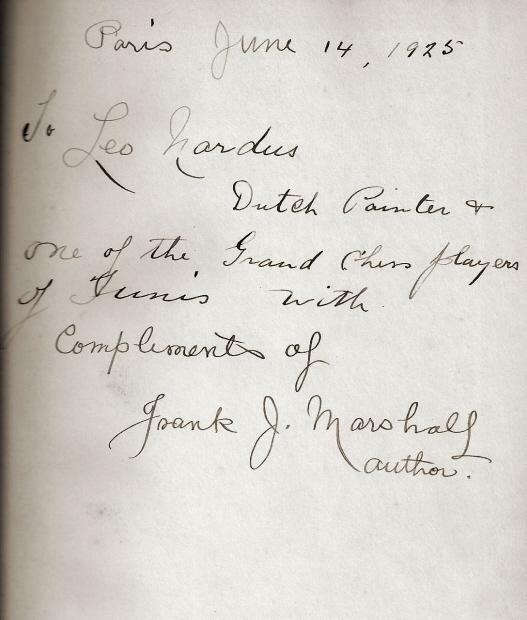 Dr Lederer had lodged a formal complaint against Dr Lasker with the committee to the effect that Dr Lasker had published statements reflecting upon his character, as well as upon the executive committee of that tournament, and which, he declared, called for an apology. Dr Lasker, it is said, agreed to abide by the findings of the judiciary committee. The committee decided that Dr Lederer’s complaint was justified and that the facts in the case did not bear out Dr Lasker’s accusation. A report of the findings was sent to Dr Lasker. 23...Rd8 24 b4 Bd4 25 Qc2 b6 26 a4 Kf6 27 Qe2 h5 28 Rc1 Rh7 29 Rc2 Qh3 30 Ra2 Bc3 31 b5 hxg4 32 Rxg4 Be1 33 Rg2 Bg3 34 Rd2 Bxh2 35 Rxh2 Qg3 ‘1-0’. This is a further example of the unreliability of databases. 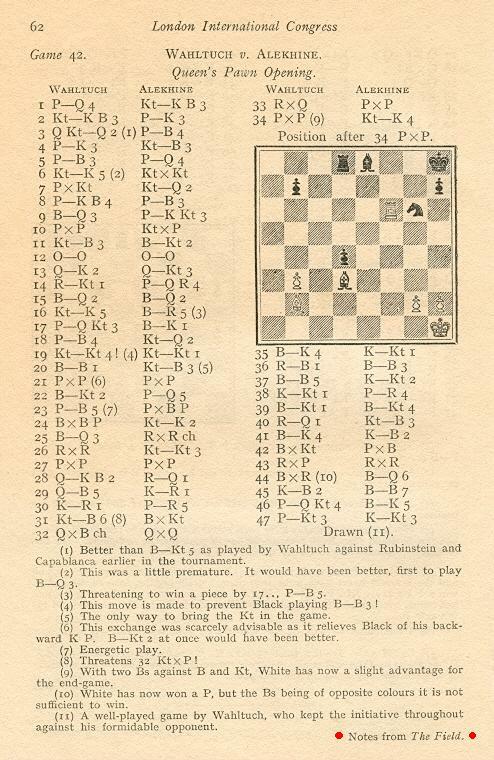 The game as given in the Evening Post also appeared on pages 99-100 of Lasker’s Chess Magazine, September 1908. 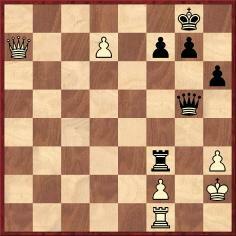 Lasker won as Black, and the game, played in Copenhagen, did not occur in a simultaneous display. 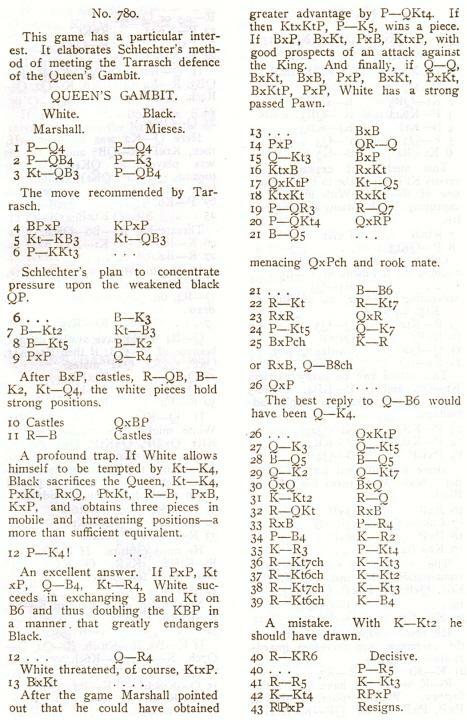 Moreover, both the newspaper and the magazine had Black’s 23rd move as ‘QR-R’, i.e. 23...Rh8 and not 23...Rd8 as given in the databases. 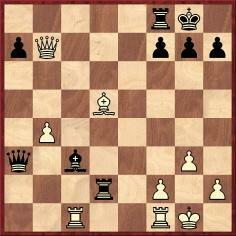 With 23...Rh8 the game’s conclusion makes sense.